The card I'm sharing with you today was inspired by a sketch I saw on a CAS blog. Although it is far too busy to enter into the challenge there, but I'll rework the main element and enter it in time, fingers crossed! I really enjoyed creating something a little different for me and love the effect the knotted twine gives. The designer paper is some I've had in my stash for some time, so unfortunately I can't remember which collection it's from, sorry! I've used the scalloped rectangles die from Spellbinders for the two panels. The die cut flowers are from the Dovecraft Garden Party range and the twine is also from that line. 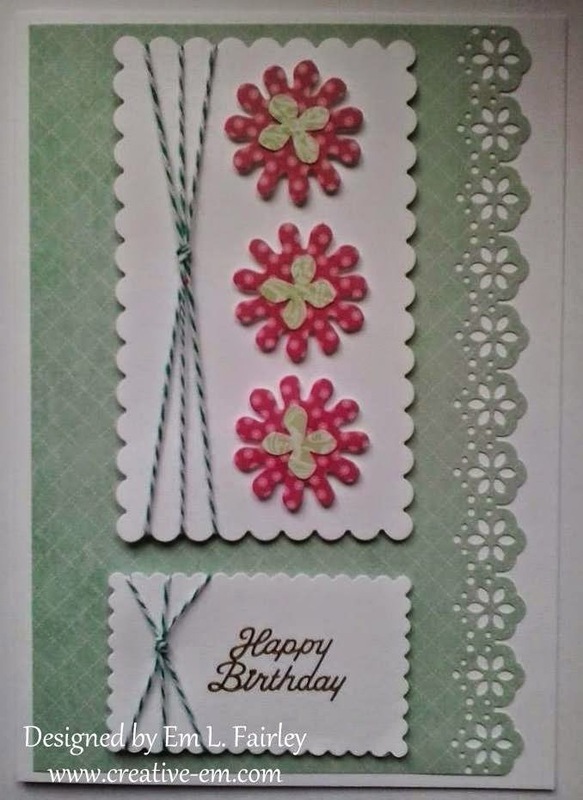 The flower centers have been punched with the Martha Stewart hydrangea punch and the edge of the paper with the Tonic Studios Daisy 2. The design has been completed with a gold peel off sentiment. I'll be back tomorrow with more crafty goodness, so I hope to see you then. Very pretty card. The sketch is fabulous and I think your take on it is just perfect! This is so sweet and delicate I love the flowered edge and all your pretty flowers. The colors are real soothing, a perfect feminine card I love it. Thank you for joining my DL.ART Thankful Thursday #132 “Anything Feminine” challenge, Have a Blessed day, DIANA L.
Very cute card, love the scalloped edge. Thank you for joining us this week at HIMCR.